Paleo Food List > Is Kombucha Tea Paleo? 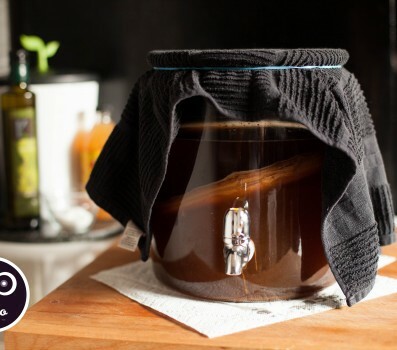 Kombucha is fermented tea, and although cavemen were probably not drinking tea, much less fermenting it, that’s no reason it can’t be included as part of a healthy diet. Tea confers a number of health benefits, notably antioxidants that help keep inflammation in our bodies down to a minimum and help boost immune function. By fermenting tea, we turn it into a probiotic. Fermentation is a natural process that does occur in the wild. Humans have been fermenting just about anything we can get our hands on ever since we figured out how to harness the power for ourselves. Not only is it not harmful (in moderation), but it can actually be beneficial. Consuming fermented foods and beverages introduces good bacteria into our guts. These are the guys we want to stick around and crowd out the bad bacteria because a healthy gut biome is connected with everything from a strong immune system to healthy skin. The one thing you have to watch out for with kombucha is the sugar content. Store-bought kombucha tends to be pretty sweet (and expensive), so you’re probably better off just making your own. Depending on how long you let it ferment, you could end up with a tea that’s still pretty sweet, mildly sweet, or downright sour. Find your preference and you can enjoy a healthy, refreshing drink whenever you want. If you’re still not convinced on the benefits of fermented foods, Mark Sisson has a whole post addressing the issue.